ROMANS 10:13 KJV "For whosoever shall call upon the name of the Lord shall be saved." 10For with the heart man believeth unto righteousness; and with the mouth confession is made unto salvation. 11For the scripture saith, Whosoever believeth on him shall not be ashamed. 12For there is no difference between the Jew and the Greek: for the same Lord over all is rich unto all that call upon him. 13For whosoever shall call upon the name of the Lord shall be saved. 14How then shall they call on him in whom they have not believed? and how shall they believe in him of whom they have not heard? and how shall they hear without a preacher? 15And how shall they preach, except they be sent? as it is written, How beautiful are the feet of them that preach the gospel of peace, and bring glad tidings of good things! 16But they have not all obeyed the gospel. For Esaias saith, Lord, who hath believed our report? For whosoeuer shall call vpon the Name of the Lord, shall be saued. Because, Whoever will give worship to the name of the Lord will get salvation. 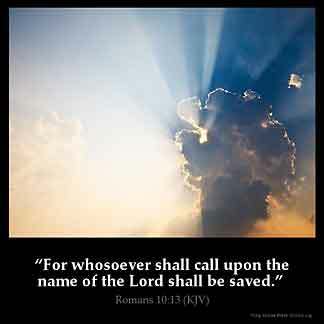 For every one whosoever, who shall call on the name of the Lord, shall be saved. For "every one, without exception, who calls on the name of the Lord shall be saved." For, "Whoever will call on the name of the Lord will be saved." For ech man `who euere schal inwardli clepe the name of the Lord, schal be saaf. Ro 10:13 For whoso ever shall call upon the name of the Lord shall be saved. See Joe 2:32. To "call upon the name of the Lord" implies, (1) That the true God (Jehovah, in the Hebrew quotation) shall be approached in worship, and (2) that there shall be something more than saying, "Lord, Lord", etc. (Mt 7:21,22). The language, wherever used, implies coming to the Lord and calling on him in his appointed way. Compare Ac 22:16 2:21 Ge 12:8. This promise of Joel, since it says "whosoever", is not limited to the Jewish race. the word is nigh thee!!! !its already upon thy tongue!!! !just say the word and salvation is yours!! Praise be to the Holy Lamb of God!!!!! "Whosoever, " It doesn 't matter your colour,race or where you 're coming from, God 's arms are widely opened to receive us,he wants to win us all back to himself.No matter our situation,how deep we 've got lot in sin,he 's calling on us ,wants to save us. Let 's give ears to his word! It means the word of God is liberal to the jews and to the Gentiles, whoever hears , and believe will be saved.